Sits in his highchair, what does he see? This verse is taken from one of our favourite children’s books, Peepo by Janet and Allan Ahlberg. I think of this poem when I pour hot porridge into our bowls in the morning. It is the first day of winter and it certainly has arrived in full force. 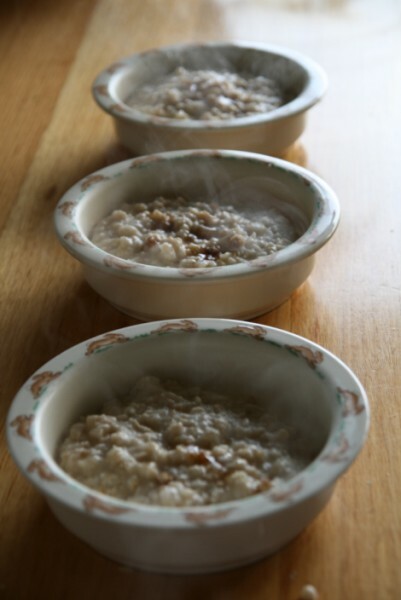 We love our porridge in the winter and I love how easy it is to cook in the Thermomix. Simply pop your ingredients into the bowl, press the buttons and twelve minutes later, perfectly cooked porridge with real wholesome oats – none of this instant stuff! Perfect Porridge in the Thermomix. I also love that whilst it’s cooking, you can go about your morning chores and not have to worry about having a burnt saucepan to clean. And the cleaning is so easy – fill the bowl to the top of the blades with water, pop the lid and MC in place and then give a couple of quick Turbo boosts. Rinse in the sink with your Thermomix brush and you’re done. That's so easy, the kids can make it! Place a quartered apple or two into the TM bowl first and chop roughly 4secs/Sp4. Add other ingredients and some cinnamon and proceed as above. Add a banana in the same manner but cook with coconut milk. Top with coconut flakes and brown sugar. Try experimenting with other grains; buckwheat, quinoa flakes, chia seeds. Cooking times and quantities will vary.